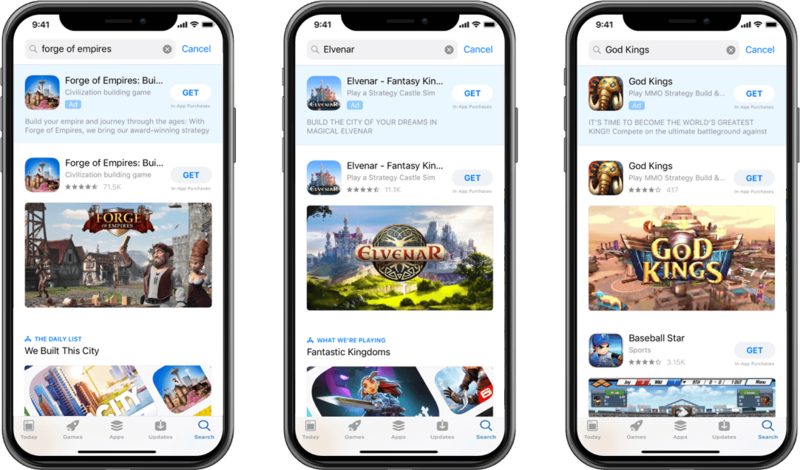 Innogames shares their Apple Search Ads journey - from becoming an early adopter to optimizing long-running campaigns with SearchAdsHQ and improving the generated profit by 22.5% compared to the year before. InnoGames is Germany’s leading mobile and online games developer. It’s famous for such titles as Forge of Empires, Elvenar, Warlords of Aternum and Tribal Wars. The company’s goal is to provide their players with both long-lasting entertainment and continued satisfaction. Before starting with Apple Search Ads in 2016, InnoGames already had a very diverse UA setup with different traffic sources. They ran performance driven iOS and Android campaigns which ranged from Search, Display and Social to Native and Programmatic. When Apple Search Ads was first announced, the Innogames team wanted to be one of the early adopters as this new ad channel promised the opportunity to address potential users in a premium placement with intent-driven campaigns. Due to its thorough experience with running Search App Promotion campaigns with Google Ads, InnoGames knew that Search Ads in app stores usually generate very good results. Apple Search Ads seemed to be the perfect opportunity to grow their UA efforts incrementally and acquire high-quality iOS users. When starting UA with a new marketing partner, usability and core features are two very important aspects. The marketers at InnoGames have experience with a variety of tools and partners and therefore approached this brand-new platform with the appropriate set of expectations. The first few months of working with Apple Search Ads proved to be challenging. The tool was still in a Beta state, so some functions were still missing, and workarounds were necessary. Examples range from certain bulk editing capabilities to custom reporting. However, this was to be expected and not surprising for InnoGames. Making the most of the first mover advantage and generating positive results were priorities, so the search of a tool to complement Apple Search Ads and get the most out of this new UA channel began. While screening several tools and service providers, InnoGames looked at SearchAdsHQ. Innogames was searching for a tool which would enable them to work more efficiently and keep an overview in terms of the manual bidding mode. On top of that, they were looking for a tool with a custom reporting solution. SearchAdsHQ made a very mature and advanced impression, it didn’t only meet our requirements but also had additional helpful features. So, we decided to go with this platform. The customization and filter options of SearchAdsHQ allowed Innogames to review important metrics and timeframes easily and fast. When it came to the automated rules, they assisted in keeping the CPAs and budgets in a healthy range to reach campaign targets. Additionally, SearchAdsHQ made it possible to do edits of bids or keyword changes in bulk. Return on Ad Spend is InnoGames’ main target KPI for performance marketing campaigns. Therefore, monitoring the effective Cost-per-Install (eCPI) as well as Lifetime Value (LTV) are paramount when managing UA campaigns. SearchAdsHQ enabled InnoGames to do so across different Apple Search Ads accounts, campaigns, keywords, and creatives. Another benefit is that 3rd party tracking data from the MMP is available in SearchAdsHQ as well. Pulling reports from several data sources to manually match them in Excel, for example, became unnecessary, freeing up time for more important tasks. With SearchAdsHQ, we seamlessly integrated our MMP data and now are able to make accurate decisions much faster than before. It was also very convenient to integrate the data into the tool. As a result, the adjustments we make in SearchAdsHQ are synchronized into Apple Search Ads quickly and bug-free. Thanks to SearchAdsHQ, Innogames managed to cut down budgets on campaigns or keywords with poor performance and increase budgets for campaigns and keywords with a good profit margin faster than before. Bulk editing features give them the chance to adjust bids, settings, etc. efficiently and save time for other important tasks like Сreative Sets testing. In general, the initial campaigns creation time has been reduced significantly. With the great reporting capabilities SearchAdsHQ offers, keeping an eye on the performance on different levels has become a lot easier and faster. Since Innogames used SearchAdsHQ to optimize their long-running campaigns, they managed to improve the generated profit in the second half of 2018 by 22.5% compared to the year before. Now we are able to create and optimize more campaigns at the same time and do more tests without losing the overview or risking overspending on poorly performing elements. With SearchAdsHQ automated rules, we also started to be more aggressive in bidding in order to scale the campaigns in the next months. Adding SearchAdsHQ to their tool-kit helped InnoGames to make the most out of Apple Search Ads. Creating, monitoring as well as optimizing campaigns became much easier and freed up resources to focus on scaling the channel. SearchAdsHQ is actually very easy to handle and has great usability. Its team showed us that they take our feedback seriously and are eager to further improve their platform. Request a SearchAdsHQ demo with one of our managers to show you around.